(Photo: REUTERS / Siegfried Modola)Women carry their belongings as they disembark from trucks carrying internally displaced Muslims, after traveling in convoy escorted by the African Union operation in CAR (MISCA) on a four-day journey from the capital Bangui, at the transit IDP center in the outskirts of the Central African Republic-Chad border town of Sido, April 30, 2014. 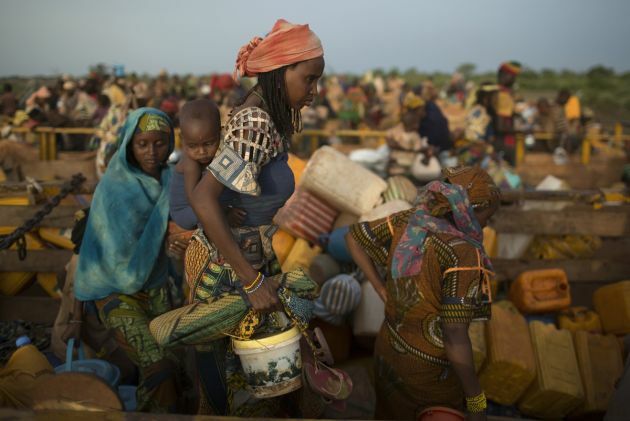 All of the remaining Muslims that have sheltered from sectarian violence in the neighborhood of PK 12 in Bangui, over one thousand, have been evacuated towards the northern town of Kabo and Sido on the border with Chad. UNITED NATIONS (Reuters) - Segregating Muslims in Central African Republic to protect them from Christian militia shows the world's failure to tackle a deepening sectarian crisis, a U.N. official said on Thursday as the United Nations scrambles to find thousands of peacekeepers. The mainly Muslim Seleka seized power a year ago, perpetrating abuses on the majority Christian population that triggered waves of revenge attacks, leading to thousands of deaths and forcing about a million people to flee their homes. Foreign troops have escorted thousands of Muslims to relative safety in the country's north, while thousands more have fled to neighboring states. Peacekeepers helped around 1,300 Muslims out of Bangui on Sunday, triggering looting and removing one of the last pockets of Muslims from the capital. "It is a collective failure of the international community that we were not able to provide the security for people in their homes," said John Ging, director of operations for the U.N. Office for the Coordination of Humanitarian Affairs. "If (the Muslims) stay they are likely to be killed. If they flee that's not the solution," he said. "The separation and segregation of communities in this country is not a solution for this country going forward." The United Nations has warned the crisis could spiral into a genocide in the resource-rich former French colony of 4.6 million people. Human rights officials say parts of the country have seen "religious cleansing." The violence has continued despite the presence of 2,000 French troops and some 5,600 African Union forces. Earlier this month the U.N. Security Council authorized a U.N. peacekeeping force of up to 10,000 troops and 1,800 police. Ging praised the African and French troops, but said: "They have limited resources and they are not able to provide the coverage that is required to give that countrywide blanket of security." "Our problem continues to be not enough and not in time," he said. While the United Nations is hoping to convert to U.N. peacekeepers most of the African Union troops currently in Central African Republic, the world body still needs to find thousands more soldiers for the U.N. force, which will assume authority from the African troops on Sept. 15. "We can't say that it's a forgotten crisis or that it's not understood what is needed ... and yet the reality on the ground continues to deteriorate because the response has not been mobilized on the scale or in the timeframe that is required," Ging said. "The problem is that not all of the member states of the United Nations have stepped up to the capacity that they have and that is needed to deal with this. Those who have thank you very much, those who haven't we need more help," he said. European Union peacekeepers began arriving this month after weeks of delays caused by shortages of soldiers and equipment. Only about 150 EU troops have arrived so far, but the strength of the force is expected to build until it reaches its target of 800 to 1,000 soldiers in June, the EU said. "The population are really now consumed by fear, despair and hopelessness," said Ging, adding that Muslims and Christians blaming each other for their plights had become the "ugly face" of the conflict. "People are losing their humanity," he said. "When members of the Christian community said to me 'the Muslims were the problem,' I said 'Muslim babies are a problem for your security? Because that's what you're telling me.'"